As a market leading production agency, we thrive on a challenge. After working on an initial bespoke sized VideoPak unit with multiple pages and die cut windows, the next YouTube video brochure posed just such a challenge. The aim was to promote their new marketing campaign based on four key revenue channels. Each of the channels are designed to maximise their clients sponsorship of key creators on YouTube. To promote each channel YouTube had created a unique video demonstrating the power of sponsorship programs, exclusive media interaction, developing relationships between brands and content creators and how to build and manage your channels. Fuse were posed with finding the best way to present the 4 videos in a unique, interactive, stylish & memorable way. A standard video brochure simply would not do. Our team worked on several ideas using hidden magnets to activate each video. The result was a world first bespoke 10 paneled CrossPak video brochure – produced to offer the user a unique, interactive experience – with individual pages, activating the 4 videos in turn – combined with die cut elements to expose the 5″ screen and Youtube’s amazing statistics – a truly memorable, thought provoking piece. 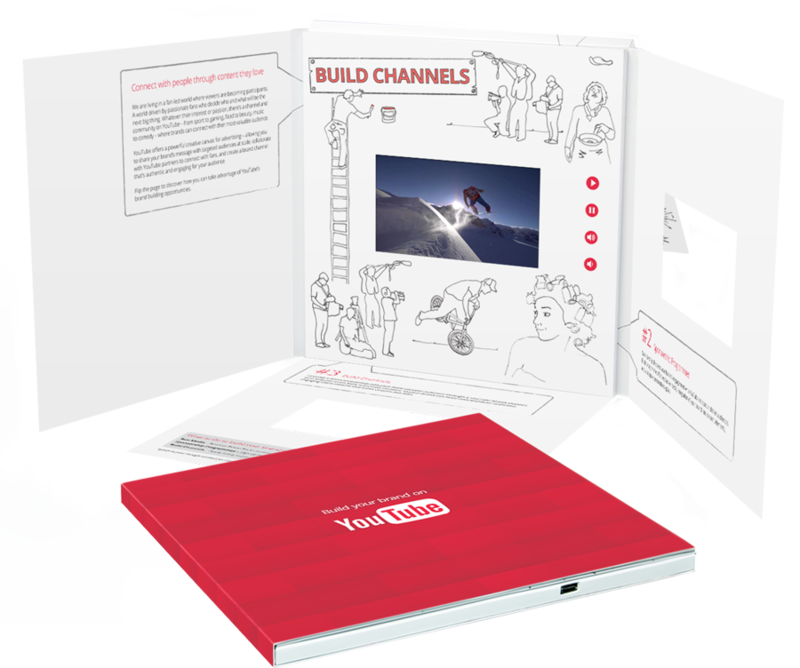 Over 300 units were produced in under 3 weeks so that YouTubes marketing team could use them during their meetings with the worlds top brands and agencies – shown to decision makers and then left behind with the client, but never forgotten. The brochures received amazing feedback and requests for pricing & CrossPaks produced for Nokia, Computacenter, Ernst & Young. The Youtube CrossPak is a good illustration of how we can rise to the challenge, work closely with our clients vision and requirements to offer original, inspirational marketing products.